Okay, for those who still haven't figured it out yet, here's the scoop: It's a 1965 Vette from the firewall-back and a 1969 Vette from the firewall-forward. Rich first saw pictures of a Vette modified in this way back around 1970-71. He always remembered that car, and he never saw another one done the same way until just recently. The recent sighting finally prompted him to build the car you see here. The 1965 section is from an AMT kit. The 1969 section is from Revell and features a grille from the Revell-Monogram Owens-Corning racecar kit. The stitched-together car rides on an MPC 1972 Corvette chassis with suspension parts from a Revell 1965 Corvette kit. 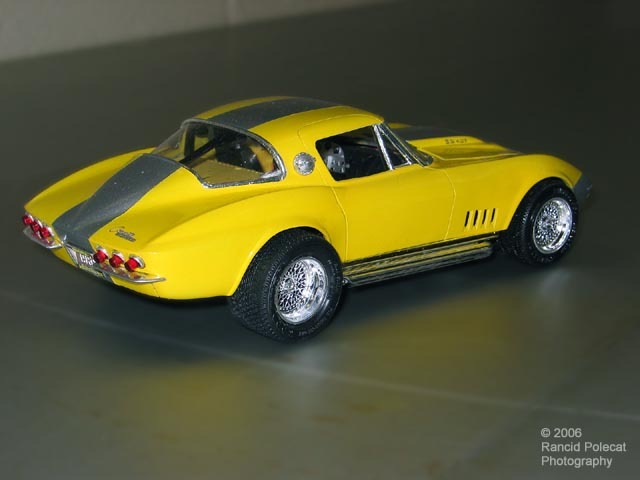 The fuel filler cap is from an Accurate Miniatures Grand Sport Corvette and the script on the rear deck is a photoetched piece from The Model Car Garage. The non-Corvette wheels and tires were sourced from Rich's enormous partsbox.